This page based on a post I made to writelog@contesting.com. As of Windows Vista, WriteLog had two very different schemes for supporting sound boards. As of version 11.24 there is a third. The pages in this blog are (almost) all about the third and most recently released scheme. The first two remain supported for legacy setups on Vista and later where all three Mixer setup modes can be accessed, but only the first is available on XP and earlier. 2. As of Windows Vista, Microsoft published the Windows Core Audio API. On Vista and later, WL no longer plays with the mixer bits and levels–you have to use the Windows controls to set the levels. WlogSbControlW6.exe is what you get in Start menu, WriteLog V11, Sound Board Mixer Control. For station microphone input, you need a separate sound board (because, using this core audio, WL doesn’t try to manipulate a sound board’s internal audio routing). WriteLog accomplishes L/R switching of transmit audio by sourcing a stereo signal that has silence on L or R, as appropriate. Echo Mic is supported inside WL by reading the mic sound board channel and writing that sound–copied to the L or R channel as appropriate and with the other silent–to the “other” channel. 3. As of WriteLog 11.24 (the most recent). WriteLog can be configured to use a separate sound board per rig. 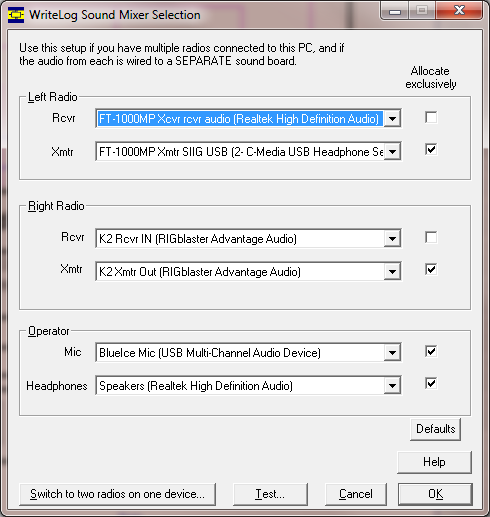 SO2R support and mic switching, then, require a total of three sound devices on your PC. WL accomplishes L/R transmit audio switching by sourcing a monophonic sound (or Left-only) on the sound board connected to the rig.